Mother always said to sit up straight. Now there’s an app and connected hardware device that can help you do just that. And it has been selling, according to the product’s makers, which first shipped their devices in January. This $149 wireless posture gizmo, LUMOback, comes in the form of a black band that is worn around the lower back, which has a sensor that vibrates when the wearer slouches. Connected wirelessly to Apple iOS devices, it then has an avatar that tracks posture and daily activities in real time. LUMOback is in the genre of a number of devices around the “quantifiable self” category, such as Fitbit, Jawbone, MyFitnessPal, Pebble Watch and other products. 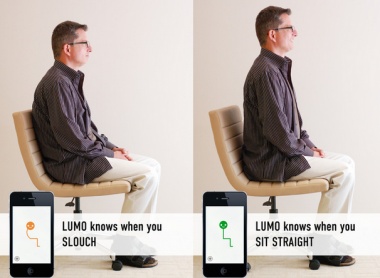 LUMOback, run by the startup LUMO BodyTech, is different in that it goes beyond the traditional quantitative apps and includes real-time actionable feedback. It also is part of tackling the United States’ $50 billion per year back-pain costs for medical care, workers compensation payments and time lost from work. Back pain is the second most common reason for missed work, the National Institute of Neurological Disorders and Stroke reports. Monisha Perkash, the CEO and co-founder of LUMO BodyTech, said the concept for the product came together during her time at Google’s Eric Schmidt’s Innovation Endeavors incubator two years ago. Perkash and her team, co-founders Andrew Chang and Charles Wang, who is a doctor, were tasked with launching a bold idea that would have positive impact on the world. While they weren’t sure where to start, they did hope to leverage their health and innovation backgrounds. Perkash was pre-med during her undergraduate studies at Yale University and her husband, a sports and spine physician, had directed her co-founder Chang to the posture lessons. Perkash said the mass number of back pain sufferers is rooted in our hunter-gatherer pasts. 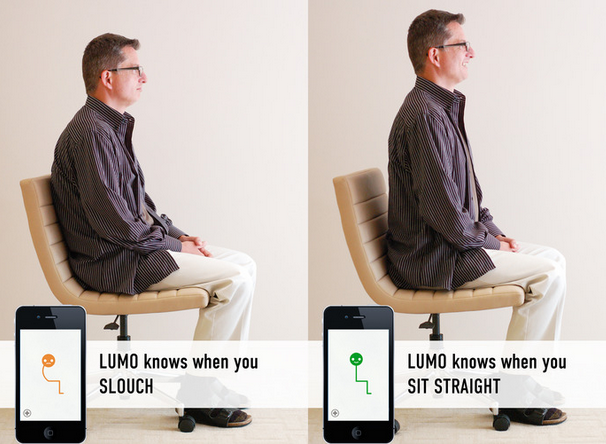 In 2012, LUMO BodyTech raised $200,503 in pre-orders of their product via Kickstarter. This was more than $100,000 the goal amount, with around 1,600 sponsors. AllThingsD reported on the $5 million of Series A funding they received back in December. The company said it has increased its customer base by 120 percent year to date, and are on a path to increase the customer base by well over 700 percent by the end of the year. Perkash said they hope to evolve and give more insight into the data and that posture is a great starting point for explaining breathing, digestion, core strength and other areas. Perkash, who emigrated from Nepal to Texas around the age of 5 years old, is no stranger to startups. She sold her first company, TuitionCoach, to SimpleTuition in 2009, and said she caught the entrepreneur bug while in the midst of TuitionCoach.